Luton boss Nathan Jones is looking to record his side’s first win on the road this season when they visit struggling Oxford United tonight. The Hatters are yet to taste victory from their six league and cup games away from Kenilworth Road this term, with two draws and four defeats. They finished last season with two draws at Notts County and Carlisle, with the last away success stretching back to April 7 and a 3-0 victory at Yeovil, some eight matches ago. Jones knows that needs to change if they are to mount a promotion challenge, saying: “Since I’ve come here, we’ve been good away from home. “I was talking to Alan McCormack about when we started here we were better away from home than we were at home, that’s kind of skipped now. “But we picked up some real good away wins last year and we’ve got to start doing that if we want to start climbing the table. “You can’t rely on your home form. Yes, if we were to win every home game and draw every away game then your points tally would be very good, but that doesn’t happen. Standing in Luton’s way is an Oxford side who have made a miserable start to the campaign, winning just once from their opening 10 games, with seven defeats. They have lost their last three home matches, but despite sitting second from bottom, former MK Dons boss Karl Robinson has a decent squad in place at the Kassam Stadium, with Sheffield United winger Ricky Holmes on loan, plus John Mousinho and experienced striker Jamie Mackie in their ranks. When asked if was surprised by their early troubles, Jones continued: “I can’t comment on Oxford, I’m more surprised that we’ve only got 13 points. “It’s a tough league and you get punished for errors, I’ve watched them and I know they’re not a bottom two, bottom three side, they’re not, with squad, structure, with what they do, they’re not that. “So what we have to do is be wary of them finding a bit of form or starting a run off, because we want to start our own run off. 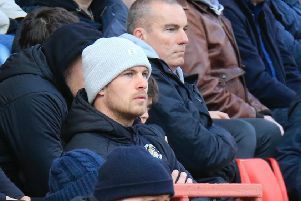 The U’s also have two players that Jones knows well, on-loan Derby keeper Johnny Mitchell, who had a brief stint at Kenilworth Road during the 2015-16 campaign, plus attacker Jonathan Obika, whom he had when with Yeovil Town. The Luton boss added: "Johnny was here for a brief spell, we had him, he got recalled, I don’t really know why he got recalled, but he started very well here and would have benefited from that. “Jon Obika, I know very, very well. We gave him his debut at Yeovil, Terry Skiverton and myself and we also signed him for Brighton as well. "I believed in Jon in terms of his goalscoring, in terms of what he has. He's a real great lad, fantastic character, good family and did very well for us at Yeovil.